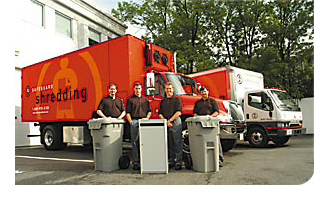 Safeguard provides a business security solution for disposing and destroying sensitive paperwork using state-of-the-art mobile shredding centers. Secure document destruction protects your company from fraud, loss of trade secrets and other security failures, and may be required of your business by recently enacted regulations. By adopting a Safeguard Shredding program, you are telling your employees that its not every-man-for-himself. We give you the tools to back your privacy policies with a reliable, consistent and well decumented procedure. We offer a variety of services & programs to meet the needs of small businesses with simple requirements, as well as large corporations with complex facilities and requirements  even companies with remote offices, branches and special handling requests. Non-recurring Purge Program  this service involves high volume bulk reduction of files & records, as might arise at the end of a retention period, time of business relocation, "spring cleaning", or when you simply need to recover limited filing space. Purging of archives is a monumental task that most companies cannot support with appropriate machinery or manpower. Clients may utilize this service method on-demand, without any contractual obligation  use Safeguard for quarterly, semi-annual or annual destruction of documents & records at the end of a defined retention period. Recurring Service Program  smart companies will seek a systematically recurring service to capture confidential material on a day-to�day basis. Critical information is constantly generated, printed and distributed throughout the office every day  creating a constant potential for of loss of sensitive information. Safeguard will design a custom security plan to capture sensitive materials from convenient collection points throughout the office. We provide free containers to securely lock away your designated materials in between service calls and you decide what frequency is best for your organization. Adopting our monthly, bi-weekly or weekly service program shows your company is consistent and serious about privacy. You'll receive third party certification as evidence of a privacy compliant program in place. Branch Operations Program  business entities that have multiple remote locations in the DC region may find that individual sites do not generate a high enough volume of paper material to justify outsourcing of shredding, yet in the aggregate they produce a high volume of sensitive material that pose both productivity and security issues. Safeguard operates its own courier service to collect material at branch locations, and then delivers locked and secured bags to your central facility or ours for same-day destruction. Businesses such as banks, settlement/mortgage companies and retail stores will appreciate the security and cost effective nature of this program. Complex Facility Program  many owner-occupied and single-tenant properties have complex security needs due to the oversized nature of the facility and wide variety of users. All users may have shredding requirements, but with very different intensity and frequency. Safeguard will track and analyze volume and usage throughout the facility, then customize multiple collection schedules for best economy. We'll ensure that containers are always available to accept material, but never overflowing. Without close monitoring and constant adjustments, shredding expense at large facilities will spin out of control, especially if traditional small scale document destruction programs are employed. Hospitals and campus oriented complexes will benefit from our versatile options and attention to detail to keep costs down. National Accounts Program  Safeguard Shredding has networked relationships with the very best independent service providers in most major metropolitan areas of the United States. Standardized pricing and master billing are offered to simplify accounting and tracking of service. Independent service providers are smaller, more flexible and more service oriented than large national companies  so let Safeguard link you into our network of high quality service providers across the country and enjoy national account pricing and convenience. Government Classified Materials  if you work with classified materials, you know the difficulty of disposing of small amounts of Confidential, Secret and Top Secret printed materials. Safeguard Shredding will provide you with short term equipment rentals at your facility (for low volume) or use of our "secure room" at our location in Falls Church, VA (for higher volumes). Our small particle shredders and disintegrators will destroy material to strict U.S. Government compliance standards. Scanning & Digital Imaging Program  preserve an electronic image of documents and records prior to destruction with consultation from our record management group. Safeguard offers professional imaging services, equipment & software products, training and on-going support required to sustain an in-house imaging program that will help clients reduce volume of paper material in office or storage. Of course, our turnkey solution also includes secure destruction of the scanned material to close the loop on document management.